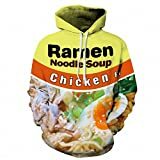 Turn some heads and get some knowing laughs with this cool, new Ramen Noodle Hoodie. 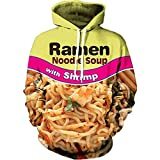 The hoodies feature larger than life representations of your favorite flavor of the famously inexpensive, go-to convenience food. 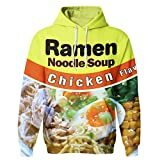 Featuring either beef or chicken flavored bowls, the only thing these hoodies lack is some of the more obscure (perhaps more delicious?) flavors of mushroom, creamy chicken, and lime shrimp. Yummm...maybe.